The ADDIE S CABIN is part of the Skihuts and Summer cabins between Ouray and Silverton Colorado at 11,000' on Red Mountain Pass. Located right on the famous Million Dollar Highway (Hwy 550) in the heart of the San Juan Mountains. Newly constructed, built for comfort with a rustic, remote, atmosphere. Fully equipped kitchen, solar powered, south facing deck, an abundance of large windows, with spectacular panoramic high alpine views, warm, dry, quiet - a year round escape. Nearby Ouray, Ridgway, Telluride, Durango, and Silverton offering shopping, music and film festivals, mine tours, train rides, museums and more. Endless recreation in some of the Rockies most beautiful mountains, out the door skiing, hiking, 4 wheel drive ATV trails, road or mountain biking, hot springs, snowboarding, sledding, fishing, mining ruins and ghost towns. Easy vehicle access, spring fed drinking water, and a hot shower. Downstairs bedroom has a Queen Bed and tree top views. 4 upstairs bedrooms with 1 full (double) bed and 1 single bed each (one has Queen bed instead of full bed). Downstairs living area, kitchen fully equipped with stove refrigerator and all cooking utensils, dining area with large dining table. Bathroom with sink and shower, and mountain views. Toilet is in an Outhouse with easy deck access. Large south facing deck with a gas barbecue. Great value, affordable family rates, children free. Perfect for a couple, single family, multiple families and small groups. Sleeps 8 Adults or 10 Maximum with children. Mid June to Mid July restricted to 4 adults or single family due to water restrictions. Forest Service FIRE BAN SUMMER 2018. NO outside fires or smoking. NO Linen Service. You must bring your own sleeping bags or bedding. There is NO cleaning service. You must clean and leave the cabin as you found it. If you do not clean everything or follow the "before you leave" instructions you may loose your damage deposit. JUNE 22 - July 12 Max Occupancy 2 Adults and children for single family. Please see our other properties in this area that are listed on VRBO Mountain Belle Cabin # 246030 or the Artist Cabin # 313496. We built have been renting the Addie S and two other cabins on Red Mountain Pass since 2000. We do this as a side business and so at times are quiet busy. We would love for you to stay with us so please be persistent and patient while we try to set something up for you. You will like staying here if you like being off on your own, able to cook your own meals, and close to some really great attractions. The cabin is quiet, without distractions, relaxing, located in a million dollar setting all by yourself. It is not fancy, it is a cabin, and although newly constructed gets used, but is comfortable. It is "of the grid" and not always quite like home. A great place to unplug from technology and to hang out and spend some really fun times with your family or friends. Inside Bathroom has sink and shower. The TOILET is in Outhouse that is easy to get to off the deck. Need calling card to use long distance. Some Verizon Service with cabin cell signal booster. Grinder, Filters and Pour Over Filter cone. Fantastic. Well furnished, lots of non-perishables spices for cooking, great grill. Great views. Really looking forward to going back when there's snow on the ground. Plenty far off the road, and a lot of land to explore. Amazing cabin. Great views. Very secluded. Make sure you are aware of the weather in the passes not just in the town below. We had to leave early due to fear of being trapped in the pass. Overall I would absolutely stay again. Cannot wait to make another trip to Co and stay at the Addie S.
We loved staying at the Addie S Cabin. 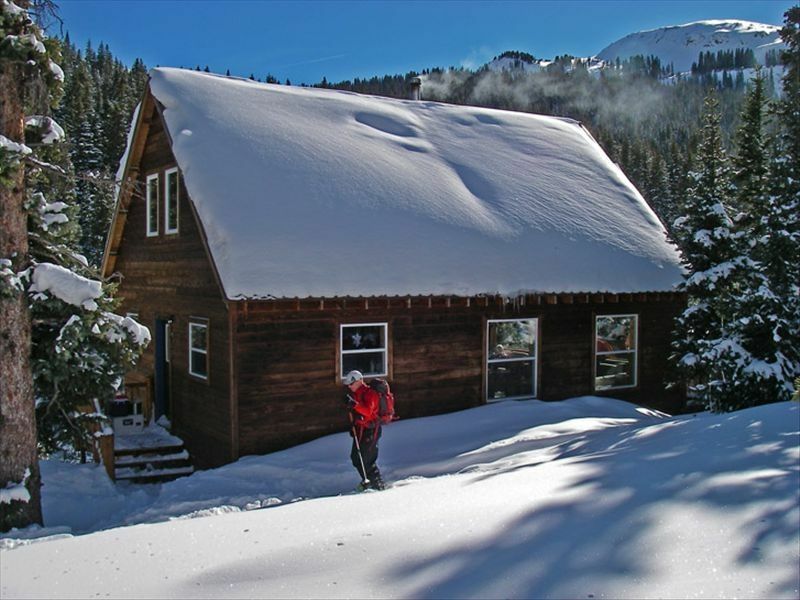 This cabin is a great place to stay and enjoy the beautiful surrounding San Juan Mountains. There was an issue with water for the first part of our stay, but it was due to limited snow and rain. If you are looking for an "off the grid" place to stay I would highly recommend it. Located on Highway 550 1/2 mile south of the top of Red Mountain Pass, 9 miles north of Silverton and 13 miles south of Ouray.